Kimberly Houston will be comparing her experiences growing up in the Civil Rights Era with the current issues. 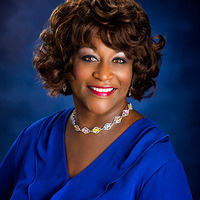 Ms. Houston currently serves as the Executive Director of YWCA of the Great Lakes Bay Region. She led corporate initiatives in her roles as Chief Diversity Officer, Global Community Relations Director and President, Dow Corning Foundation. - All faculty, staff, and students are encouraged to attend this free luncheon.